February 6, 2019 EA has some big expectations for Anthem sales. 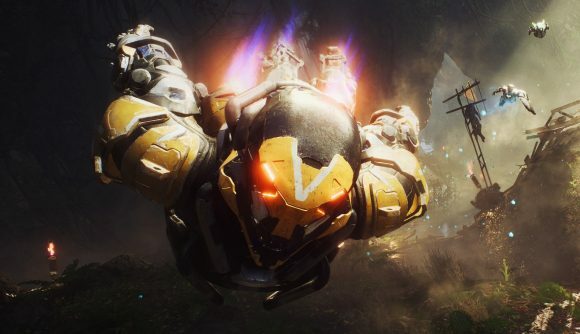 EA has some ambitious expectations for Anthem’s launch later this month, as the company tells investors its models point to sales for “Anthem units in the 5 to 6 million unit range” by the end of the company’s financial year. EA also hopes that the game’s launch will bring more players to Origin Access Premier, which will give full access to the game as part of a monthly subscription. This comes after a disappointing third-quarter result for EA, which is partly because Battlefield V sales failed to live up to expectations. Despite selling 7.3 million copies, the World War II shooter fell short of the company’s projections by about a million copies. It also sold fewer Origin Access premier subscriptions than the company hoped. Besides Anthem, EA’s also pointing to some new stuff on the horizon, including a new shooter in the Plants vs. Zombies lineage, which the official Twitter confirmed shortly afterwards. There’s no official mention of the title Garden Warfare 3, but that’s certainly what it sounds like. But that likely won’t come into play for this fiscal year. Neither, it seems, will the impress Apex Legends player count we’ve seen so far. EA says it does “not model material net bookings for Apex Legends” in this last quarter of the financial year. Seeking Alpha has a full transcript of EA’s earnings report. Notably, in the last report CFO Blake Jorgensen said the “fourth quarter will be stronger than we had originally forecast, driven by higher expectations for Anthem and Command and Conquer Rivals.” At the time, the company attributed the increased expectations to a surprising amount of interest in the new IP. Anthem’s out very soon, and will likely play a major part in EA’s next financial call – we’ll soon find out if that’s for better or worse.